Education • Filmmaker says he was trying to draw attention to black history. Courtesy YouTube Stand up comic Dave Ackerman goes to Brigham Young University to find out what BYU students know about Black History Month in a video posted to YouTube. 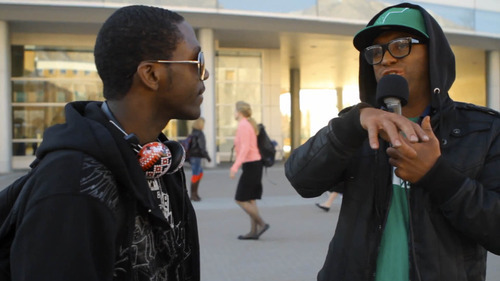 Courtesy YouTube Stand up comic Dave Ackerman goes to Brigham Young University to find out what BYU students know about Black History Month in a video posted to YouTube. A YouTube video in which a stand-up comedian in black face interviews Brigham Young University students about black history is getting hundreds of thousands of views  and sparking criticism that it is exploitive and offensive. Responses of students interviewed by Dave Ackerman show a limited grasp of African-American history and perpetuate racial stereotypes. One student said he celebrates black history this way: "We love our fried chicken and go with some grape juice." A former BYU professor, who is black, said Ackerman's attempt to demonstrate how little white college students know about black culture was "well intentioned" but marred by his use of black face. "These notions are deep-seated stereotypes about the black experience, controlling metaphors regarding the nature and character of people of African descent. People have died over these words in our nation's past, and the re-enforcement in a highly racialized society like ours today allows these images and words to continue to wound the soul," wrote Darron Smith, an African-American sociologist who used to teach at BYU, on his blog. Ackerman, a graduate of Utah State University who never attended BYU, said he was attempting to spark draw attention to black history and culture during February, which is Black History Month. In an interview with KTVX Ch. 4, Ackerman explained his motivation: "I wanted to raise awareness in an interesting way and get a conversation started." The final title card of the video says "fight ignorance with ignorance." He did not respond to a request for comment from The Salt Lake Tribune, relayed through his brother, Utah filmmaker Joel Ackerman. Campus officials dismissed Ackerman's video, which had nearly 300,000 views by Thursday afternoon, as a cheap caricature. "We feel this is a misrepresentation of the sentiments and feelings on campus. We are concerned about the remarks stated in this video and are disappointed by them," said BYU spokeswoman Carri Jenkins. "I have heard from students that know students involved and say there was some selective editing, perhaps manipulative editing. The remarks do not reflect our community of more than 30,000 students." Jenkins noted that BYU, where only one percent of the student body is black, actively observes Black History Month, kicking it off for the past 20 years with the Walk of Life on Martin Luther King's birthday, followed by lectures and cultural events. The private university is operated by the Church of Jesus Christ of Latter-day Saints, which has its own troubled history with African-Americans. Ackerman's technique borrows from British comedian Sacha Baron Cohen, who adopts strange personae (think Borat and Bruno) and tapes himself interviewing unsuspecting people. In his video, Ackerman asks students to name black historical figures. One mentions "the lady on the bus," a reference to desegregation activist Rosa Parks. Others name actors Will Smith and Samuel L. Jackson and rappers Tupac and "50 Cents [sic]." Many named Malcolm X, but had no idea what the assassinated human rights activist did to earn a place in history. Ackerman also asked about interracial dating and whether black men do better with the ladies than their white counterparts. "Look at Brandon Davies, he's doing pretty good," said one student, referring to the BYU basketball star, who is black and was suspended from play last spring for Honor Code violations. In another exchange, a female student said white men who act black are "tools," while black men who act white are "classy." "The kids are extremely naive, and Ackerman exploits that," said Smith, now a professor at Wichita State University in Kansas. "Where it went south was the use of black face. He doesn't understand how offensive it is." Black face was a minstrel tradition where white actors darken their faces and hands while imitating blacks, portraying them as lazy, oversexed and ignorant. What passed for humor a century ago, however, has long been considered racist and Smith said he was disturbed that students didn't comment on it.